Note: after you upload a graphic it will take a few minutes before it shows up for others to see and download in the Commons. On your profile, under your Tools menu select "upload graphic". In the first section enter a title. Please see our guidelines for how to name a graphic here. In the next section upload either a JPG or PNG file of the graphic. Select "upload." You can choose the "dark background" option if the image is white. Add the dominant colors in the color field. See our guidelines for tagging here. 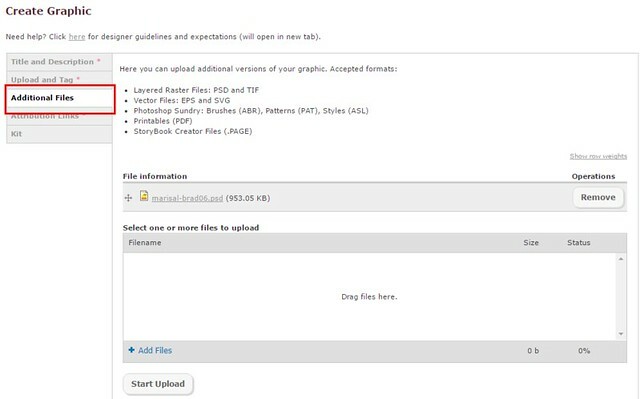 The next section is where you can upload additional file types if you have that ability. Simply drag and drop all the files you want to include and click "start upload". You will want to wait for them to finish before moving on. In the Attribution Links section you can add any Pixel Scrapper graphics you used to make the graphic. Or else if the graphics if completely of your own creation, select "no." 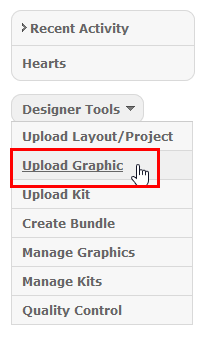 Before you click "submit graphic" if you are a level 2 designer or above, you can set the publish date to whenever you want the graphic to publish in the future. Many designers prefer to spread the graphics out until the next bundle/kit is scheduled to arrive, or at least to keep too many things from appearing at once. How you plan to schedule things is completely up to you.